At this time of the year, when your purchasing is probably at an all time high what with all of the end of year sales, your Christmas decorations are probably up or will be soon, and you’re spending much more time at home, hibernating until warmer weather appears. You might be noticing that your home feels more cluttered than you would like. Today I thought I would share with you places in your home that you can declutter which will help your home feel like a stress free oasis. Clearing out your wardrobe is something I think a lot of people tend to put off doing. They search through their wardrobes every morning when they are getting dressed, ignoring so many clothes that they never wear. Does it suit me and do I feel good wearing it? Is it free of stains or holes? If you answered yes to all three of these questions, chances it deserves a spot in your wardrobe. If you answered no to any of these questions, it’s time to donate/sell/throw it away. Having a wardrobe filled only with items you truly appreciate, you will find getting dressed in the morning is so much easier and enjoyable! It can be so easy to allow your kitchen cupboards to build up with food that you forget is there. You go to the supermarket every week and buy the food you need, put it in your cupboard, and the food that was already there gets pushed to the back. Chances are that you have a fair few items in your cupboards that are either expired or you will just never eat. I would recommend you remove every. single. thing. from your cupboard, and sort your food into 3 piles. The first pile is food that you will eat and is still in date. You’ll put this food back in the cupboard. The second pile is food that is still in date but you won’t be eating any time soon. This food can be taken to the local food bank so it doesn’t go to waste. 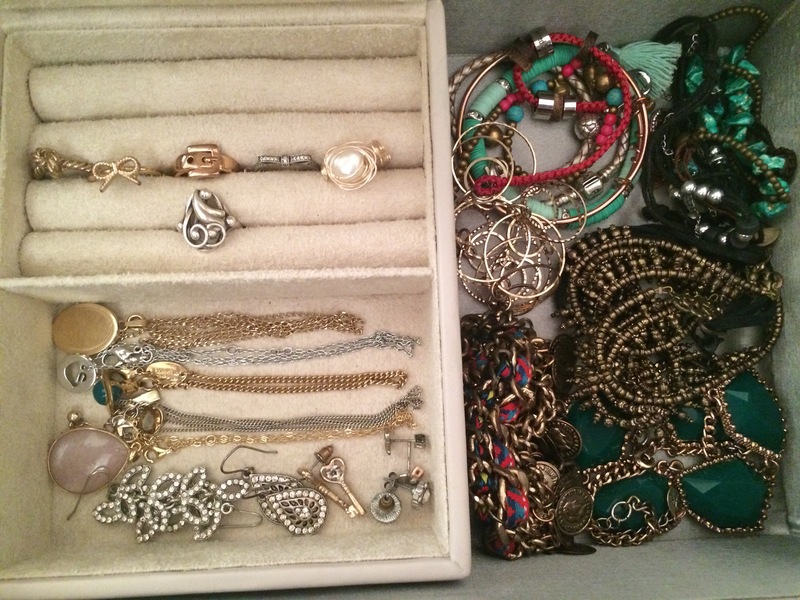 Your jewelry box is the home of all of your most beautiful and precious items. But I find that it can get so tangled and messy that you can’t fully appreciate the beauty of your possessions. 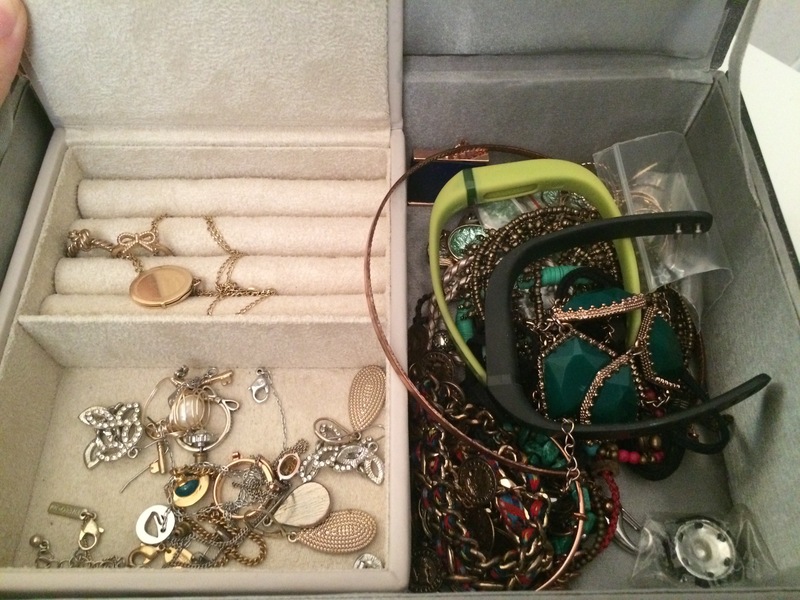 Going through your jewelry box periodically will help keep everything organised so you can make the most of your pretty things! Untangle your necklaces and lay/hang them neatly, put all of your earrings together in pairs so you can quickly find them when you want to wear them, and organise your pieces so you can see everything easily. You may just discover an old favourite all over again! Before, things had been just chucked in here and it was a complete mess! This is probably the most cluttered thing you own. This is basically your walking bin. You chuck so many things in it over the course of the day. If you’re like me, you probably have receipts, empty food wrappers and other gross things lurking in the bottom of your bag. I like to go through mine at least once a week. Literally just dump everything out and onto the floor. Only put the items you need back in your bag. Throw away the rubbish and put away the things that you want to keep but you shouldn’t be carrying around on a daily basis. Not only will it be easier to find things when you’re out and about, but you’ll also save your back and shoulders from the unnecessary weight that you are lugging around. I hope that this post has inspired you to declutter at least one thing in your life! I promise you will feel such a sense of satisfaction after doing it. The feeling is seriously addictive, I find it strangely enjoyable!